Due to popular demand, I have released Mokee OS for the Acer liquid mt. It is a heavily themed Chinese Rom (In English) and is based on cm7. STATUS: complete I will update when anyone finds a bug, or when C3C0 or Sheenick makes a new update. There are addons that work with this rom in the ZTE skate mokee of rom. These are the center clock, themes and softkeys. FULL 4.0 ROM: this is on lfdesigns.tk and it includes all the patches that have been posted below. The apps have been replaced, no wipe needed or performed, but make a nandoid backup just to make sure. Flash superuser zip after update, it might of deleted it. Fixed SU, Overclock and torch in statusbar. Now everything is working the same as cm7. The google docs is messed up so click file, then download. Flash this over 3.1 (sorry bout that, I might make a final ROM with everything in it. PS: I am no way responsible if you brick/ ruin your device flashing this rom (neither is modaco). You will lose all your data, so remember to back up. FIX: In AzurMetalS Control go to Advance and press Reset Wallpaper, then choose a background; this you must do so every time you reboot, and you want to change the background. due too the long boot time, I decided to check for bigger files just after 5 new boots. fixed log, it could probably get too big. we have 1 GHz why not use it? 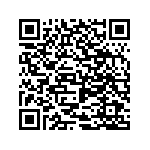 To install the ROM use this version of CWM. If you don't know how to install a custom ROM or CWM read thisguide. Please read the whole post before posting problems. I cover everything you need to know to get the most out of this ROM and how to fix common problems. If you ask something that I cover in this post I will not reply. The Vanilla version looks the same as the stock ROM so there is no point putting up screen shots of it. I have removed all the Acer apps/bloat (but kept Breeze UI) and updated all the system apps and replaced or updated a few system files (Google Play is installed instead of Android Market and Adreno 205 drivers have been updated etc.) Also added a few system management tools. I have also removed the default email app as most people will just use Gmail. If you need it you can grab it from here. But there are much better email apps that you could use like K-9 Mail or ExMail. If for any reason you need an app that was removed (Acer Media Player, DLNA client etc.) here is a zip with all the default system apps including the older version of the apps that got updated. links2sd (not included in AD2SDX version) So you can store your apps onto the SD card. I recommend setting this up the minute you boot into the ROM and change the settings so it automatically places apps to the SD Card. The Acer Liquid Metal works with EXT4 thanks to TechnoLover's Kernel so I would use that on the seconded partition. If you have no clue what I am on about with EXT4 and partitioning use CWM to set it up for you (doing this will wipe the SD card so back it up). Hold down the Focus button and +Vol while powering on the Phone (the focus button is holding down slightly on the camera button). Once in CWM go to: Advance > Partiton SD Card and use about 512 (you could set this to 1024 but I really do doubt you will ever fill that as internal memory does still get used even with using links2sd, and the internal memory will be full before you fill 1024 ) and swap to 0. When links2sd asks you what your seconded partition is formatted as it will be EXT3. If you have a Class 10 SD Card on the other hand you may want to use the AD2SDX version. It will give you a lot more internal memory to install apps onto then Links2SD but you don't have any control on where to store the apps as it will automatically place the apps onto the SD-EXT. To use just make a second partition at the end of your SD of 2GB (anything between 512MB to 2GB is fine) as ext4. It must be ext4 so you won't be able to use CWM to do the partitioning for you as it uses ext3. You will need to use GParted Live CD (or MiniTool Partition Wizard for Windows) to format and partition your SD card to ext4 (lots of guides online on how to use both programs). Remember you want to select EXT4 and you do not need a swap partition. I Would also install SD Maid if you decide to use the AD2SDX version as there is no way of telling how much internal memory is being used (but don't use it to clean the system as this can break apps). When the internal memory is full the phone will start having issues. So keep an eye on it. Remember using this you can still move apps to the SD as you would normally. App2SD is installed on the AD2SDX version and is a good way of doing batch moves, it also tells you which apps are safe to move and which ones aren't. No-frills CPU I don't get why CPU managers have got so many features now. You only need it to set the frequency. For that I found this is one of the best. 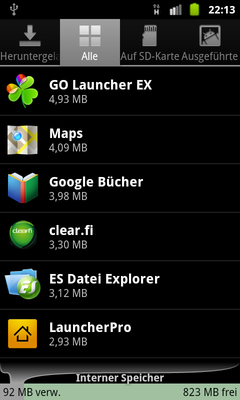 File Expert The default ROM doesn't come with a file browser. This is my fav. If you have one you like more you can remove this with links2sd (links2sd can remove any of the system apps so if there is one installed you don't want, use this to remove it. Just make sure USB debugging is turned on. You may also have to reboot the phone after removing an app. For the AD2SDX version you can use Root Uninstall). Camera ICS has replaced the default Camera as the one it comes with really isn't that good (it may crash the first time you open it, but after that it will be fine). ICS Keyboard. Its just nicer to use then the gingerbread one. JuiceDefender added to help with battery usages. IVONA Text-to-Speech HQ. Much better then the Speak & Spell type voice that Android default voice uses. You will need to download the voice files but everything you need is in the ROM. Speaktoit. Gives you the same functions as Siri for the iPhone. Root Uninstall. So you can easily remove system apps. App2SD. Program to do batch move of apps and tells you which apps are safe to move. The main thing I have done with the ROM apart from remove apps and add system ones is greatly improve its speed. This is mainly done by using TechnoLover's Kernel but I have also done a few other things to the ROM to improve the performance even more, like changing VM size, optimizing the GPU drivers and database plus many other little tweaks to get the most out of the device. As this is called the "Performance Rom" I thought I better share some benchmarks. This is using fresh install of Vanilla Version - Links2SD V4.3 set to the highest settings (only drocap2 and Quadrant was added) . As you can see there is a fair bit of improvement from the first release of the ROM. By default the CPU is clocked at 1GHz but can go as high as 1.6GHz if you set the Voltage high enough (but will drain your battery pretty quickly). The GPU can be over clocked to 384MHz using MT Control but I found that it caused graphical tearing set to that, so the highest I would set it to is 368MHz. Installed the Google Talk with Video chat. Sip/Internet Calling over WIFi or 3G. Fully Multi-Lingual. Has the same amount of languages as Cyanogen, but Settings.apk hasn't been fully translated yet. Adreno 205 drivers have been updated. Beats Audio added, I have noticed that sometimes when I flashed the ROM Beats Audio wasn't working. If this happens when you flash the ROM you can fix it by flashing the BeatsAudiob0314.zip I have attached. (to get the most out of Beats Audio turn on Dolby Mobile in settings and choose Auto under Music EQ and reboot the phone). aGPS installed for improved GPS so you can lock onto more satellites. Mobile BRAVIA® Engine improves video processing. 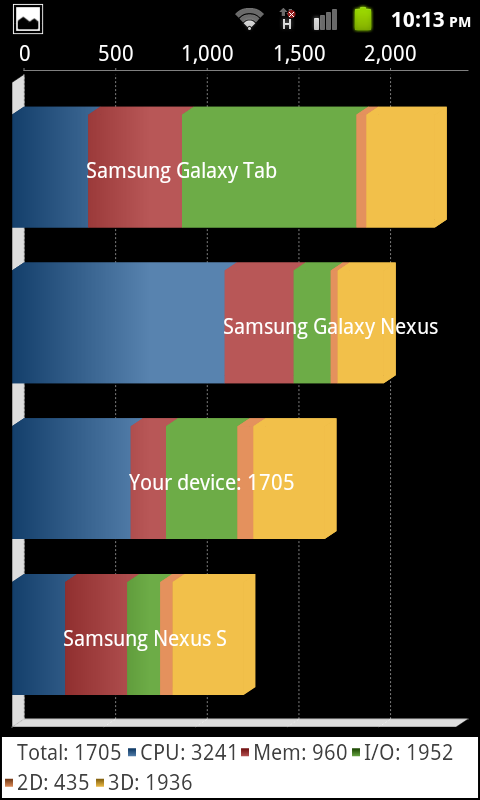 V6 SuperCharger fixes many of the Android memory problems and speeds up the phone. Cleans up Cache and redundant files on boot. The Phone is now identified as a HTC Desire S, this is so you can install Gameloft games like Modern Combat 3. Play Store unlocked. 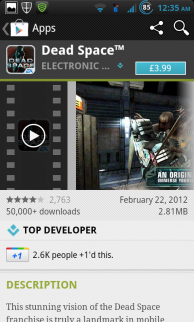 99% of all the games that are on the Play Store will now show up so you can install them like Dead Space. There is a CWM Zip placed on the SD that is call Remove_Breeze_UI.zip that will completely remove the Acer Breeze UI and replace it with the Gingerbread AOSP interface. Plus many improvements taken from this thread. Big thanks to Redflake that did the theme for the ICS version. jiego that helped with the Update script. TechnoLover that made this whole ROM possible thanks to his awesome kernel. "Gmail keeps crashing". If this happens go to Manage apps then find Gmail, select it and click on Clear data. Once you have done that it won't happen again (you will need to set up gmail again). This method will also fix any other programs that are misbehaving. "Using Speaktoit to set an alarm makes the Acer Clock widget crash." Its a bug with Speaktoit. Hopefully an update to the app will fix that. "The home button isn't working". Make sure you do a wipe before installing. "I get write_raw_image("/tmp/boot.img","boot") error when trying to install". Make sure you haveGingerbread installed and not Froyo. "Its stuck at booting". The first boot takes ages so give it at least 5 minutes. The second boot will be faster. Before installing do a nandroid backup. Step 1: Follw this guide and install Gingerbread if you haven't already got it installed. When is talks about installing CWM use this version. Step 2: Partiton the SD Card as shown at the beginning of this post. Step 3: Decide what version you want to install and flash it using CWM. Step 4: Boot into the phone giving it at least 5 minutes boot. Pick you language and time zone. 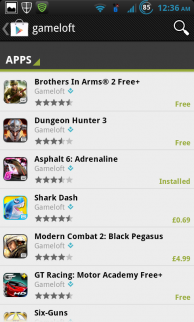 Step 5: Setup wifi and log into the Play Store and type Gameloft. If you can see games like Six-Guns and Moden Combat everything is working fine. Step 6: *You Must Do This To Fix Notifications*, Boot into recovery and flash Fix_Bubble_Notifications.zip patch that will be placed on the root of your SD card to fix issues with the camera and notifications. Ideal to build your own ROM from or if you like the look of the default Acer Breeze. This one is using a slightly modified version of the HC bat new statusbar theme that Redflake Made. All I have done is added some 3D transitions to the theme. This ROM is the same as the vanilla one apart from the new theme and added transitions. I have also added a live wallpaper and some ICS themed widgets. Everything you see in those screen shots can be done once the ROM is installed. 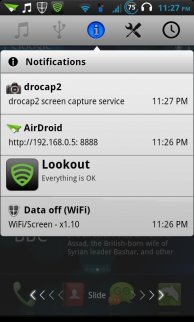 The two widgets in use are calledCustom ICS Search and Glass Widgets, and the live wallpaper is called Mood ICS. If anyone wants to build a ROM from this feel free to do so. You don't need to ask me beforehand. Same as the player in the Blue ICS ROM. I keep getting asked about this so lets clear it up. ICS-Style_Telephone.zip is the only file you need to install to get the theme. The other one is so you can return back to the stock Telephone app if you don't like the ICS-Style one.